This friendship is full of joy and cheer as they support and temper each other at the same time. Because they’re both very curious and active, the Aries and the Aquarius get along very well. For example, the Aquarius will never say “no” when the Aries will want to take part in a new adventure or to go to a place they both haven’t been to. In return, the Aries will never laugh at an innovative idea the Aquarius has. Furthermore, the Aquarius will never be bothered by the fact that the Aries wants to take the lead in everything because he or she would anyway be busy with too many humanitarian causes. It’s very possible the Water Bearer will sometimes accuse the Ram of being too busy and selfish, but they’ll both easily forget all about the quarrels between them. An Aries and an Aquarius may not necessarily be best friends, but they surely get along very well because they both love going out and even taking part in extreme activities. Neither of them likes doing nothing and not having people around. Both the Aries and the Aquarius have very active minds, love to make jokes and are highly intelligent. This is a friendship in which two people can make fun of each other because their optimism doesn’t allow them to see things in a negative light. Therefore, the Aries and the Aquarius will never talk about deep subjects and try as much as possible to live life to its fullest. It’s possible for their friendship to start after they’ve been together as a couple. It would be better for them to be just friends because the Aquarius can get too flirtatious and the Aries is jealous anyway. If neither of them imposes some rules on the other and they’re both feeling free with each other, they can be good friends for a lifetime. It’s true the Aries needs to be allowed to lead, but as said before, the Aquarius doesn’t mind allowing him or her to do this. When together, these two will take risks, do crazy things and deal with many challenges as nothing can stop them from being active, efficient and interesting. More than this, when with the Aquarius, the Aries becomes more creative and wants to do everything that seems a little bit out of the ordinary. The Aries is very lively, the Aquarius has vision. It’s possible for them to also compete with each other, but this only makes their friendship the more exciting. Because they’re both interested in the new, communication between them will always go on very well, not to mention they’re both fascinated by adventures and don’t want to ever get bored. Some of the other people will look at them and say they’re weird because they’re always trying to impress. These two are the type of friends who travel to faraway and exotic places without thinking too much before deciding to do this. It takes them only a minute to buy the plane tickets because they have strong chemistry and can really rely on each other to do things spontaneously. Furthermore, it seems the Aquarius and Aries friends always know where the other is standing and can guess what they should do next in order for both of them to be happy as friends. They can make each other feel very good and are associated with the bringers of new energies and an interesting atmosphere. When together, they’ll criticize each other honestly, employing a good sense of humor and they’ll talk about all kind of new ideas that are inspiring both of them to do great things. While a little bit sensitive, their friendship is still very intense and enjoyable. 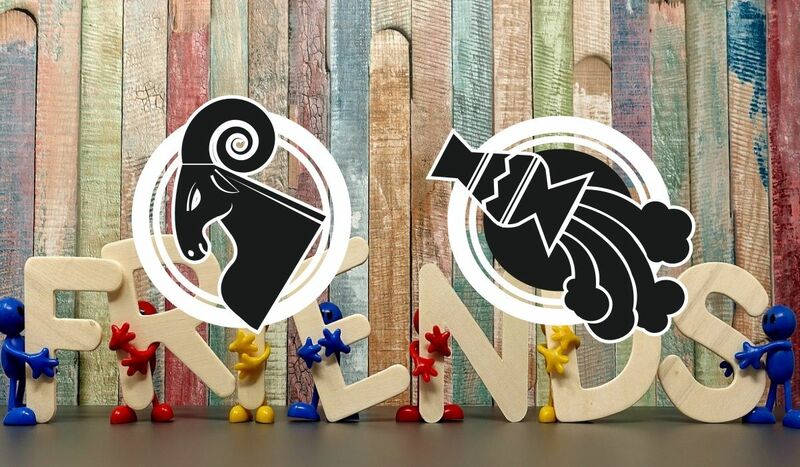 The Aries is known to fight for others and to believe in his or her friends, this being the reason why people in this sign are such good leaders. When with the Aries, the Aquarius always gets to be defended and the first doesn’t mind taking any risk for his or her friend. It’s easy for the Aries to get together with people, but all the natives of this sign are usually looking to be around individuals that help them one way or the other. They want to only be best friends and number one for anyone, so it’s possible for them to become too bossy and to not realize that their authority is bothering, not to mention their selfish ways and possessiveness are not all the time appreciated. It seems people in this sign are true masters at encouraging others to keep being positive, but without them being unrealistic. It’s great to have an Aries around when things are becoming difficult because he or she is a master at letting others know everything is going to be all right. When having trouble moving forward, just call an Aries and things can become good again. More than this, Arieses are known for boosting moods and for making people as happy as they are themselves. These natives love to dance, to travel and to tell a good joke, just to make their loved ones feel better as they can’t stand when someone is feeling down. It’s simply impossible to be sad around them because they’re all the time happy and jovial, so they inspire good faith and usually make the day of a person with only one word. The Aries and the Aquarius admire one another because the latter loves how the former has a lot of energy, the force to make things happen and is impulsive. On the other hand, the Aries adores how the Aquarius is creative and always has vision. It’s possible the Aries wants to do something new, but doesn’t know what to. People born in this sign are highly energetic, yet they don’t have all the time new ideas, which makes the Aquarius their perfect friend. While the Aries may think of the Aquarius as cold and not at all interested in their friendship. Aquarians can be quite distant and usually give the impression they don’t care. However, if these two want to resist as friends, they need to accept the fact that they’re different. The Aries is ruled by the planet Mars, while the Aquarius by Uranus. With Uranus as the planet of innovation and imagination, the Aquarius gets a lot of vision and is able to come up with new ideas, regardless of the situation. Influenced by Mars, the Aries will help his or her Aquarius friend put any idea into practice. They’re both pioneers in life and have many things in common because neither of them can stand conventions and new methods make them thrive. The Aries is much more active and fast thinking than the Aquarius, while the latter has more stubbornness and is a little bit more persistent. It’s possible for them to sometimes argue about their romantic lives, careers and money. However, if they won’t try to control each other, they’ll be great friends who don’t have to worry too much about their connection. It’s important for these to not be imposing on one another because they’re both independent and can’t be told what to do. While the Aquarius makes friends immediately, he or she has only a few people that are close to his or her heart. Natives of this sign are open to talk with anyone and don’t judge, regardless what ideas and morals they see in others. However, they expect people to have some values and to be intelligent. As a matter of fact, Aquarians are only interested in being friends with those who stimulate them intellectually and want to cultivate friendships with those who are all the time busy or trying to learn something new. Furthermore, they’re always knowledgeable and can be counted on when it comes to talking about facts. Knowing how to communicate very well, Aquarians are also generous and caring. It would be better not to allow them to lead in friendships because they have a tendency to make others feel inferior. It’s also possible for them to just talk about all of their feelings in one conversation, which means giving too much information and making people feel like they have a duty to take their emotions into consideration all the time. When it comes to the friendship between an Aquarius and an Aries, the first is an Air sign, while the second a Fire one, which means their relation is good because air helps the fire burn. The Aquarius will always support the Aries to be enthusiastic and to put his or her ideas into practice. When it comes to physicality, the Aries is more active and will probably carry the Aquarius outside for all kind of sports activities. When the first will make the ideas of the second work, they’ll both end up being happy about the fact that they’re good friends and that no one can stand in the way. While the Aries is cardinal, the Aquarius is one of the fixed signs, which means the first will always give the latter confidence and make him or her want to fight for his or her ideas. Therefore, these two won’t just agree with each other, they will also do the many things that go through both their minds. The Aquarius can always come up with new plans that inspire the Aries, so these two can all the time encourage one another to take their projects to completion. However, because neither of them wants to acknowledge the superiority of the other, they may sometimes fight. What’s best about them being friends is the fact that they can always put their plans into practice. It can be said that this is a friendship of many talents and great productivity. Just as long as the Aries and the Aquarius stay together, everything is possible.